Working in tech is always a bit of a rollercoaster— namely because patterns seem to keep on repeating. Back when I began to create websites in the late 90s I found I could create a website that had the time on it. So I put this clock ‘feature’ on a few websites. Back then, it was a big deal. A clock! On a website! Now of course, the time is everywhere and we are much more likely to look at our phone before our laptop or PC clock, let alone one that’s on a website. In a similar vein, back then everyone I built a website for was obsessed with how I was building said website. The technology was new, ‘coding’ wasn’t a thing so much as ‘computer programming’ and it certainly wasn’t something kids were lining up to learn. This meant that it was all a bit of an enigma and as a result, folks were really focused on what the technology did and how the backend of it worked, rather than thinking forward to what they could do with it. They wanted the clock because they could have the clock and the technology behind it baffled them (and would therefore, as the thought-process goes, baffle and impress their customers). No thought was given to whether their customers needed a clock, nor whether it was relevant to a site selling socks. Come back to the present day where we have UI, UX, web marketing, SEO and all manner of other things. We forget about the nuts and the bolts of a website and just focus on what the end product looks like and how it’s used. But it sure took us a while to get there. I witnessed something similar when social media became a new term in the late 00s, almost a decade after clock-gate. Businesses jumped on the bandwagon and began posting spontaneously, instructing interns to set up Facebook and Google plus pages. Long before they knew what to actually do with them. Thankfully Pepsi learned how to engage with it’s audience over the years.. And stopped saying ‘tweeps’! Again in this instance, brands were so focused on being able to post on social media that they forgot to think about why they were posting and who they were posting to. Each update reeked of the hard sell. Product after product. Or in many brand cases, using the channel to try and direct followers back to their Facebook page or website without any real engagement or offering. Nowadays, brands are much more attuned to using social media in order to tell a story and build a brand that consumers want to follow. They don’t care about the channel itself?—?they care about the message they craft on it. You’ll find that social media updates today have the same layers of meaning and brand messaging that advertising once prided itself on. So where am I going with this? Well like most cycles, I see the trend repeating itself a third time. In this instance, with digital signage. As we’ve documented frequently, when content is hard to update people don’t. For a long time there’s been a shroud of mystery surrounding digital signage and getting content up onto screens in stores, restaurants and other establishments. People are scared of the screens. They don’t know how to connect them, how to work media players, or what wires go where. If they do, by some freak occurrence, manage to get a video reel or image up onto the screen. That’s it! It stays there. The marketer or IT person retires to their desk, content in the knowledge that they managed to get the technology working. Quite a feat! Meanwhile, the screen in question bores their employees/customers/clients to death with the same excruciatingly-bland video on loop over and over again. Sometimes it gets even worse. Just check out these examples — screens with copy errors, Windows digital signage campaigns showing the blue screen of death, portrait content on landscape display. The list goes on. Why? Because the person managing the digital signage is obsessing over what the screen technology does and how it works rather than how the content can be used on top of it. My company built a product, ScreenCloud, based on that premise. 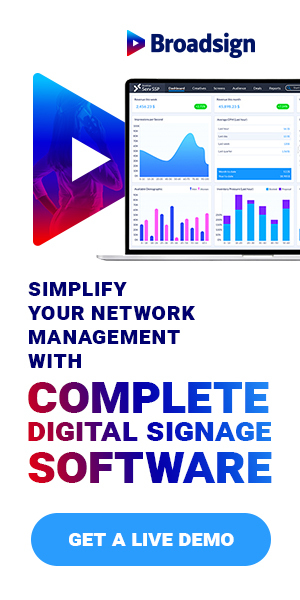 The idea that updating digital signage should be as easy as updating a Facebook status or downloading an app to your phone. We wanted to create a way where anyone?—?from the receptionist, to the marketing manager, to the IT guy, can hook a screen up to any type of content. Adding images, videos, URLs, presentations or social media feeds and editing them at anytime?—?from anywhere. Our latest growth figures and customer feedback shows that our hypothesis was correct. When people are given simple tools, they create better content. They stop worrying about what the technology does and what it is, and instead start thinking about what they can do with it. In short, they forget about the scary screens and instead start thinking about what they put on. What type of content their audience wants to see on a Saturday, compared to a Monday. What type of content will get the customer to visit their website or return to their store. Now I’d much rather look at that type of content than another clock any day.